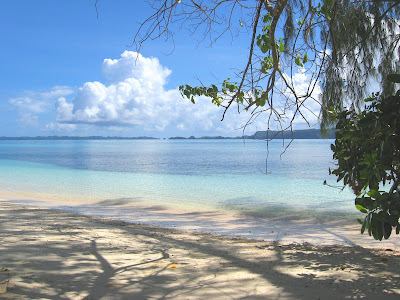 Margie's Beach gives you a beautiful panoramic view with other islands in the background. You can easily kayak to other beaches. There is a sunken Japanese Zero not far away. 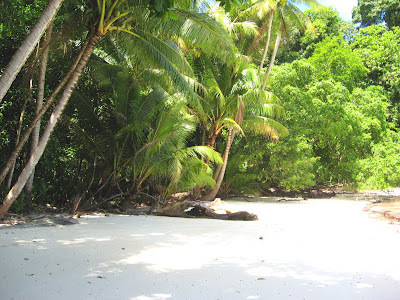 Margie's Beach is the closest one to Koror (not including the beaches around Nikko Bay). It was the beach that I had the least time alone on. The first evening a couple came out and cooked a dinner for themselves. Then as I was settling in for sleep some folks got off a boat and joined me. That was interesting because they went out with a bucket to catch their dinner and came back with a coconut crab (which they shared with me). The next day just as we were finishing our morning coffee several boats arrived and a swarm of Palauans hit the beach with coolers of food and excited children. It was Saturday and a very large picnic had been organized. It wasn't until the sun was almost down that I had the beach to myself (but I did get to share in Paluan picnic goodies). There were no rats, again I saw a feral cat. The photos that follow are of beaches and the area near Margie's, it's a good one for exploring. 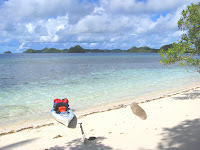 You are close to the Milky Way and the wonderful protected area behind a row of Rock Islands. 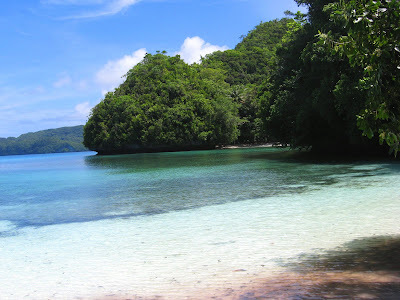 Copyright 2008 - 2019 Kayaking Palau All rights reserved.